Butler’s Quality Contracting Ltd. is a leading-edge custom home builder, renovator and general contractor. They build and renovate homes in St. John's, NL and in surrounding communities. Whether it's on your own land or on their land, Warrick Butler and the team at Butler's Quality Contracting provide a home building and home renovation process that is highly professional and personalized. They meet the specific requirements of each homeowner. From a starter home to executive style to multi-unit, Butler's has built and renovated over 100 homes. The homes have ranged from 900 to 15,000 square feet. Whatever the size, Butler's appreciate the level of investment that is required for a new build or renovation. As a result, they remain competitive in the market, no matter the size of your project. Please take a few moments to familiarize yourself with Butler's full range of Services. Butler's also appreciate the level of trust an owner places in their home builder. For this, they deliver award winning results! Butler's Quality Contracting recently received its third Customer Choice Award from the Atlantic Home Warranty program. A true testament to the level of service you can expect from the entire Butler's team. 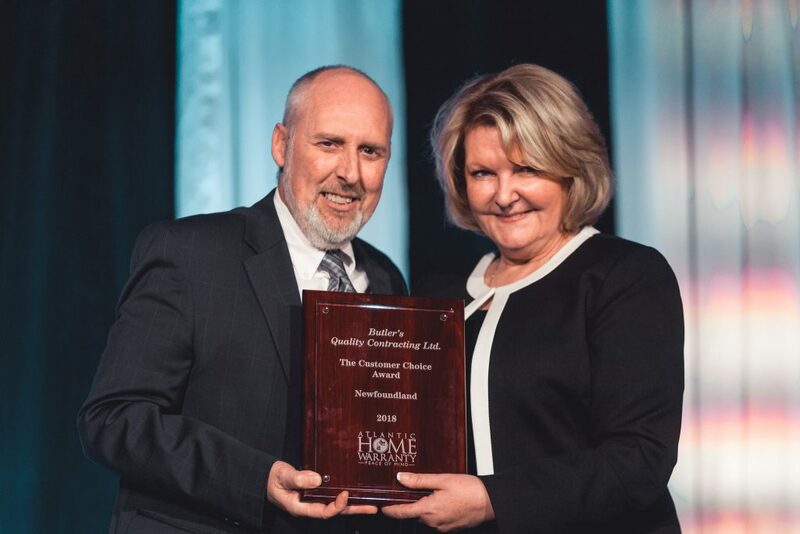 Shown below, Warrick Butler is presented with the 2018 Customer Choice Award by Cindy Locke of the Atlantic Home Warranty. Butler's is an active member of the Canadian Home Builders' Association of NL. The company has been awarded many prestigious CHBA-NL New Home and Home Renovation awards through the years. Please visit the Achievements page to learn more about Butler's various awards and accolades. "Warrick is a credit to the construction business. His professionalism, quality of construction and most of all his caring for our home was evident from day1...excelled in all areas...the attention to detail was outstanding." Please visit the Testimonials page to see what more of their clients are saying. Thank you for visiting. Please take a moment to check out the rest of the site.